It’s hard to be an American fan of Fatal Frame, even before the long-awaited Western release of Fatal Frame: Maiden of Black Water. I bought a copy of the Japan-exclusive fourth installment when I visited the country, and got an external hard drive for my Wii U to accommodate the latest installment of the series. But even so, such efforts are usually worthwhile – I enjoy the Fatal Frame series a lot because of its different approach to the survival horror genre. In contrast to, say, Resident Evil‘s action-oriented gameplay and Silent Hill‘s reliance on atmosphere and psychological terror, Fatal Frame is far less predictable in its scare tactics. 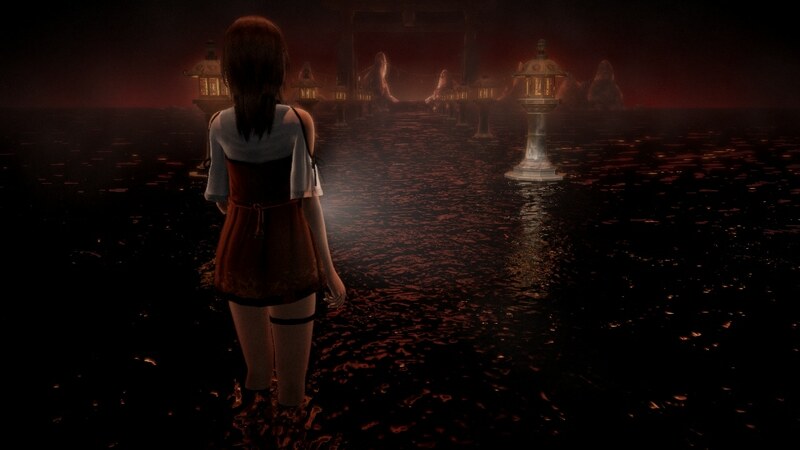 While Fatal Frame has elements of the two series often compared to it, it really brings out the fear by its combination of atmospheric scares, supernatural elements, and the central mechanic that gives the series its name – a camera that quells unruly ghosts. 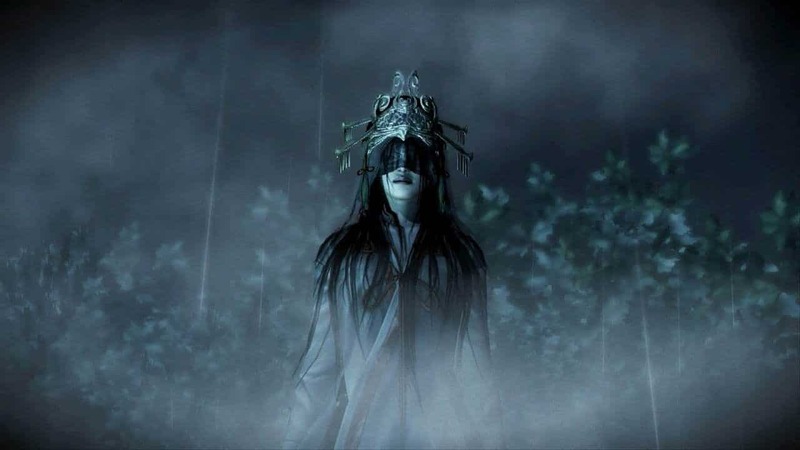 Despite this, there hasn’t been a Fatal Frame released in North America in quite a while, just after Koei Tecmo, its developer, signed a deal with Nintendo to release the series’ future installments on the company’s consoles. As one would expect, sadly, the aforementioned Wii-exclusive Fatal Frame: Mask of the Lunar Eclipse never made it outside of Japan thanks to some game-breaking bugs, and Americans were denied the Wii remake of the series’ best installment (in this guy’s opinion, anyway), Fatal Frame II: Crimson Butterfly, for apparently no reason whatsoever. 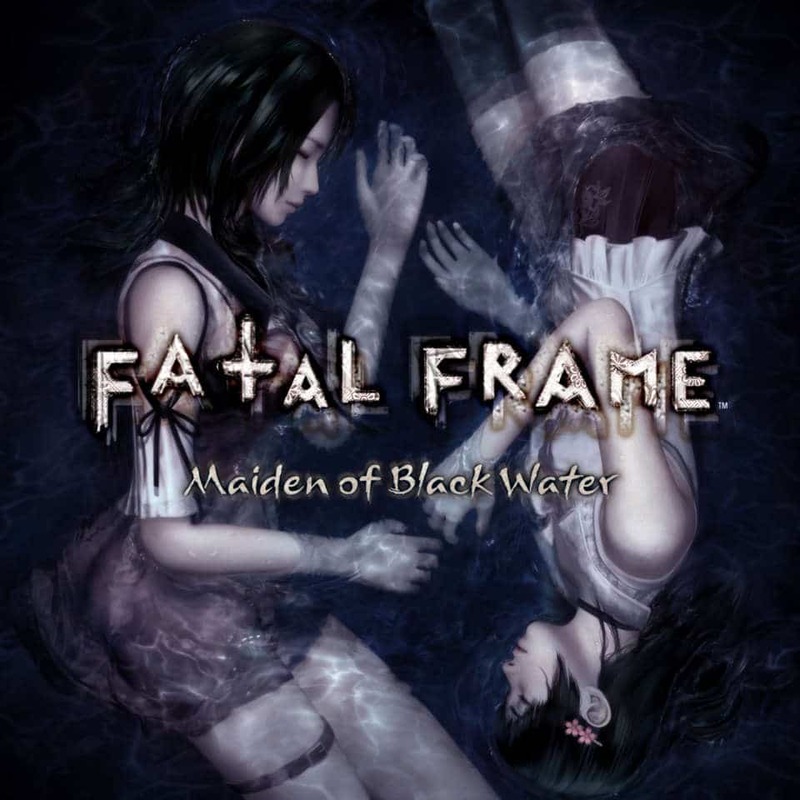 Now, Fatal Frame: Maiden of Black Water has finally arrived, the first Fatal Frame installment to get a release here in almost a decade…albeit as an eShop-only release in North America. Fatal Frame fans in this continent just can’t catch a break, can they? Neither can this maiden fair…here she is, the eponymous Maiden of Black Water herself, Ouse Kurosawa. Not one to mess with. It’s a shame that Nintendo went digital-only in North America with this one, as Fatal Frame has come back with a vengeance, and both new and old fans will be pleased. Fatal Frame: Maiden of Black Water has a compelling story, memorable scary moments, and an innovative control scheme that makes fantastic use of the GamePad’s functionality. While Maiden of Black Water has an overall simplicity to it that makes it a great series introduction for newcomers, the compelling story even by the series’ standards, a laundry list of additions, and incredible attention to the most minute details will give Fatal Frame veterans plenty to love. And plenty to get scared by, too. 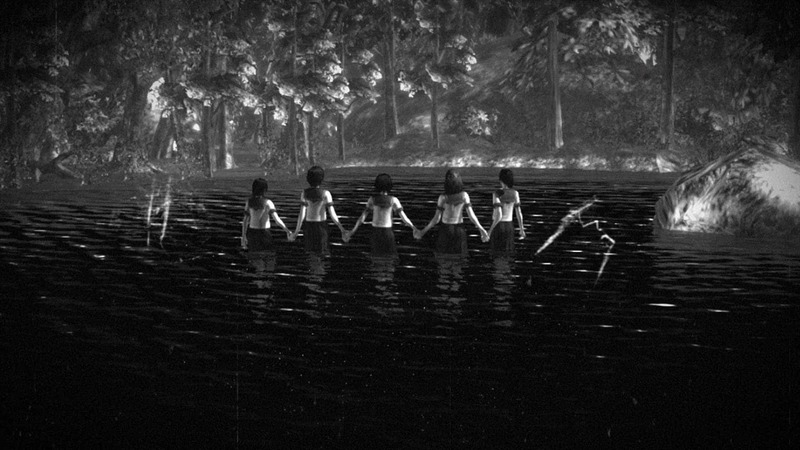 This scene in particular, near the beginning of the game, starts things off with a bang – and earns this game a well-deserved M.
Fatal Frame: Maiden of Black Water marks the Fatal Frame series’ jump to HD, and it looks beautiful much of the time. In keeping with this installment’s motif of water, the water effects are truly fantastic, and the lighting, character models, and environments all look excellent too. It’s no secret that the infamous Dead or Alive Soft Engine was used for this game’s development, especially with the buxom character models, but there’s also no denying that series’ level of detail lends itself well to Fatal Frame. This stands despite some occasional jagged edges and very minor dips in framerate. 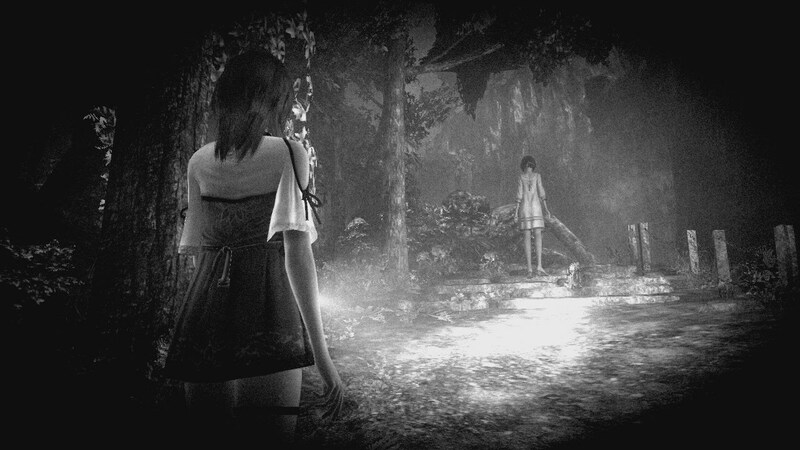 Indeed, for a game with some truly ugly ghosts, the beauty of Fatal Frame: Maiden of Black Water is evident. This game puts painstaking details in its environments, from inns and shrines to lakes and rivers, and everything in between. Seriously. This rivals Bayonetta 2 as one of the most graphically stunning games to ever hit the Wii U. Look at those water effects. Marvel at the detail. The story is where most games in the Fatal Frame series truly shine, and Fatal Frame: Maiden of Black Water is no exception. This time around, the supernatural happenings occur on Mt. Hikami, which contains a forest where people go to commit suicide. In the game, you play as three characters with interconnected stories – as in the other games, two are female, and one is male. Yuri is a girl with some hidden talents: she can find out the history of an item simply by touching it, and she can also see ghosts. After her mentor and rescuer, Hisoka, disappears after trying to find a girl lost on the mountain, Yuri uncovers some of the goings-on at Hikami. Ren, one of Hisoka’s friends, is an author writing a book on spirit photography, and he assists Yuri in her investigation. Miu, who initially helps Yuri and Ren in their quest to find out the meaning of the strange events on Mt. Hikami, harbors a rather strange secret. No spoilers, but she ends up linking Fatal Frame: Maiden of Black Water to the other games in the series. In all, the story is incredibly well-written and twisty, and I would say it’s in the series’ upper echelon because of its treatment of a very difficult theme – in this case, suicide – with an equal amount of reservation and disturbing scares. Let’s just say these girls aren’t here to play in the forest. And a quick note – Mt. Hikami is based on the Aokigahara forest, located on the northwest base of Mt. Fuji in Japan, which is also a well-known suicide spot. Considering the Fatal Frame series’ obsession with Japanese mythology, this is no accident.